Unity3D is the most powerful game enginethat is available in the gaming industry at present. You can make games in iOS, Android, Windows Phone and almost in any platform using the Unity 3D. Apple has indicated that Swift is the best programming language in the market at present and Google has hinted that they will be soon considering Swift as the standard language for Android as well. Swift is the standard language though for Android we need to wait for a while. Java is the core language for Android at present definitely. Similarly for Android programming in Windows Phone, you will need to use Xamarin and hence programming languages keeps on changing but the game engine remains the same and it is the Unity3D. All cartoons required for the game walkthrough can be fetched from the Unity 3d and the best part is that Unity 3d can be used for almost all the platforms and for making 2D as well as 3D games. 4D is also on card and it is an assurance that it will be available first through Unity 3D. Unity 3D is quite strong and you won’t find anything missing. We have some very talented and hardworking Unity 3D developers who work using Unity 3D on various platforms. Luckily we cover all platforms and hence you are entitled to get everything under one roof. Get Unity 3D developers for all platforms at TECH NERDS now! Smartphone users in the US play games more often than they watch Netflix, Hulu or YouTube. Virtual Reality made $1.8B in its first commercial year. 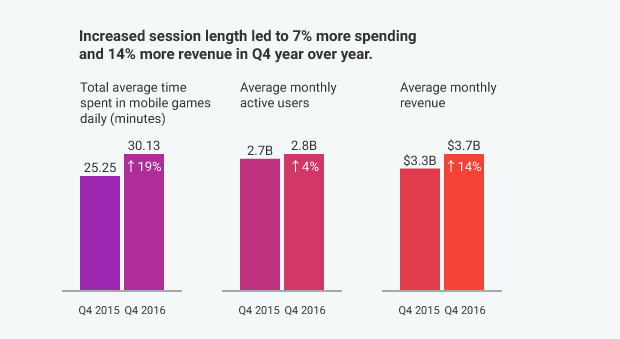 More American mobile gamers played puzzle games than any other genre. Actually, all the above statements are true. They come from a new report based on, among other sources, 49 million unique transactions and 15 million unique gamers globally. SuperData’s 2016 Mobile Games and VR Year in Review is full of charts, graphs, statistics and conclusions, which can help you make sound game development decisions. Fill in a short form to get it for free now on the Unity website.